We are just over a week away from the Mobile World Congress 2017 later this month in Barcelona and the leaks concerning devices that will be unveiled there keep coming in. 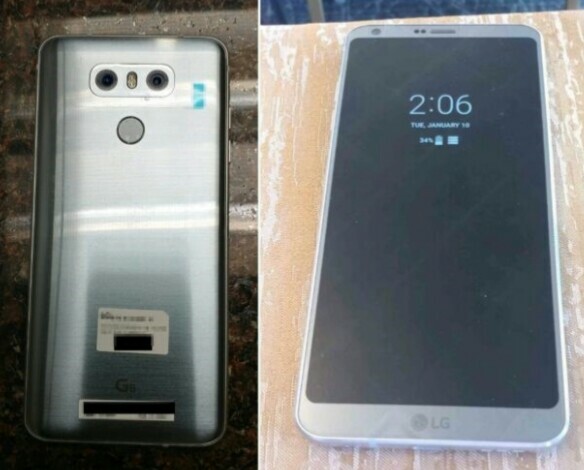 We’ve already seen countless renders and leaked images of the LG G6 and now there’s a fresh leak making the rounds online that brings us new leaked photos of the LG G6. The latest leaked photos of this device confirm basically everything that we’ve seen about the design in previous renders. The LG G6 is LG’s next flagship smartphone and it’s eagerly awaited by many of the company’s fans. The company has gone in a different direction with the G6 considering that it’s ditching the modular concept that LG opted for with the G5. These images have been leaked online by 9to5Google and they confirm the design that we’ve seen in leaked LG G6 renders. We can see that it’s going to have a very nice and very big display up front with an all-metal construction. The dual-camera setup is also visible. Similar to what we’ve heard about this handset in the past, it’s claimed in the accompanying report that the LG G6 will be powered by a Snapdragon 821 processor with 4GB RAM and 32GB of onboard storage. It’s going to have a 5.7 inch Quad HD display with 18:9 aspect ratio, a 3,200mAh battery as well as Android 7.0 Nougat. LG is going to officially unveil this handset on February 26th as part of its appearance at the Mobile World Congress 2017 in Barcelona.